You can call it third time the charm as the stars finally aligned to allow us to catch the magical Jake Shimabukuro and his captivating trio in concert at the Franklin Theatre on October 19, 2017 as the Nashvlle Sessions tour continued in Mid Tenn. Like a lot of people we became interested in the talented four-stringer when his video for a dazzling cover of "While My Guitar Gently Weeps" performed live in Central Park began to go viral. He played that fabulous song with many other surprises throughout the generous one hour and forty five minute set on Main Street. 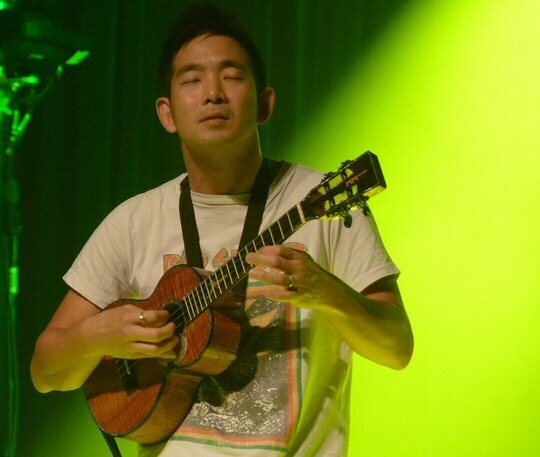 Jake Shimabukuro onstage at the Franklin Theatre in October. 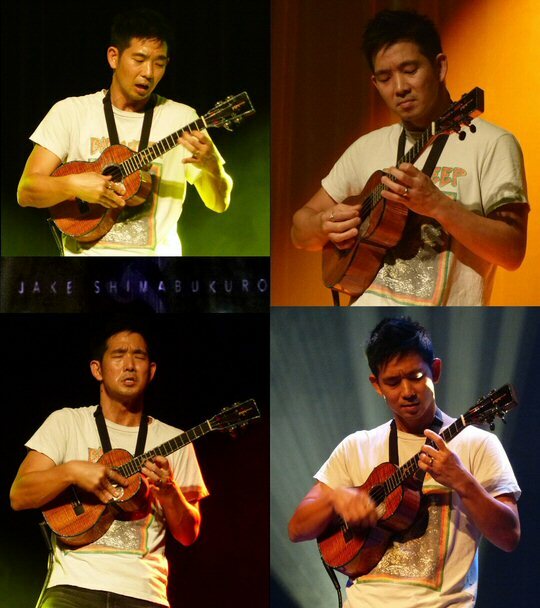 Jake Shimabukuro is a wonder, a curiosity and perhaps a novelty but all in the best way. He emerged from Hawaii having picked up the ukulele at the age of four and has gone on to single-handedly make the baby brother of guitar actually seem cool. Jake is a literal poster boy for the instrument and music stores here in Nashville have trouble keeping the adorable tools of musical accompaniment in stock. Of course, not everyone will be able to play like Shimabukoro. At the start of his career a younger and perhaps rightly rebellious Shimabukuro played with a more progressive and jam band style putting his electric uke through loops and foot pedals. This may have been great for the stoners but Jake began to respect his true roots by returning to a more traditional style even as he often tears up the thing like a Hawaiian Hendrix. For the Franklin faithful Shimabukuro included a few additional well-known and well-presented covers such as the holy "Hallelujah", along with a beautiful Beatles' classic "Eleanor Rigby", a challenging take on Queen's "Bohemian Rhapsody" and a preview of a yet to be released yet timely run through "Time Of The Season". This last one has us thinking that the current album cycle tour is coming to a close but will begin again soon with the new record that will most likely keep his current team in tact as Jake said they recently recorded the Zombies favorite. Flanked by guitar and bass the group displayed many of the songs from the new album which has been called one of Jake's most adventurous, multi-faceted and engaging records to date. The trio interacted well with each blending elements of jazz virtuosity together with heartfelt melodicism. Still, unless required the outfit did not overpower the smaller yet focal point and purpose of the whole show - Jake's prowess on the uke. The night was alive with compelling, comprehensive compositions that explored the trio's atmospheric and avant-garde musical acrobatics. 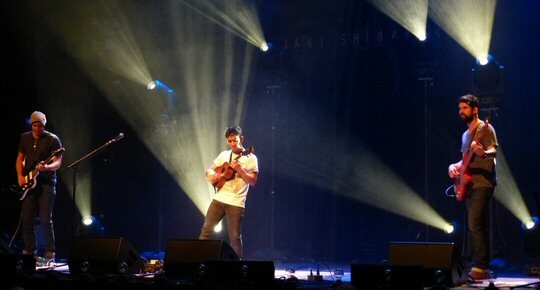 Jake Shimabukuro and his talented trio in Tennessee. Shimabukuro showcased his skills on a medley of solo acoustic uke that revealed high-quality strumming and the distinctive bright sound of his instrument of choice. Choose a word - intricate, innovative or instrumental - Jake is all of these things and more. We were truly thrilled to be watching a unique effort by a man called superstar and virtuoso in many quarters. For his encore Jake presented a track he said came from thinking about the first traditional song most Hawaiian children will learn on the ukulele. Jake couldn't helping throwing in a bit of 'Stairway' into "Kawika" as the piece began to climb to a place not originally intended and in a flurry Shimabakuro began for the first time all night to really showcase the instrument in electric guitar mode blazing for a few minutes that was the only real "Jimi" moment of the night. Jake gave a shout out to all of his family and friends in town for the show with props to the sound and lighting crews who provided lots of colors and special effects that captivated but did not distract from the presentation. The legendary Franklin Theatre is located conveniently in the heart of downtown Franklin on historic Main Street. The charming venue is in close proximity to a wide variety of shops and restaurants. Upcoming events include Restless Heart, POCO, Martin Sexton and Bruce Cockburn. Jake Shimabukuro put on a thrilling and colorful performance.